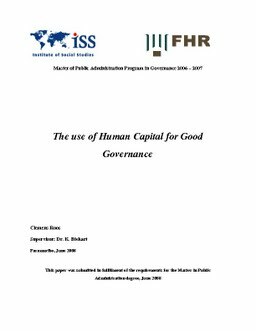 The concept of Human Capital is an important factor in the several Public Administration concepts such as Governance, Good Governance and New Public Management, but it is not identified as such. To get a view of the position of this concept, this thesis is concentrated around the role political loyalty plays in relation to knowledge, expertise and experience when the making appointments for senior positions in the government. It turns out that political loyalty prevails over education and experience when senior positions are staffed and that there is no policy, or policy intention regarding Human Capital. Further outcomes were that personal records from civil officers, kept by the Ministry of Home affairs are in most cases not up to date and incomplete and that not all assessed ministries had job descriptions and requirements. Deputy Directors who were in position for long periods without additional trainings were replaced only at their retirement. Also officers holding insufficient university degrees from unrelated disciplines and a lack of experience were not unfamiliar. Most of the policy advisors were retired political loyalists without sufficient education. It is a regular habit to ignore functional requirements when staffing high level positions, to facilitate political allies. There also exists a population of so called ghost officers, who receive a monthly salary, without delivering any performance, what puts a burden on the financial resources and has developed into a form of rent seeking. With the above sketched situation with no place and attention for Human Capital, achieving Good Governance will be difficult or maybe impossible. .Improvements can be made by introducing a transparent selection procedure with a system of checks and balances for applicants. Another option is to create a pool of professionals that are trained for the high level positions, regardless of political affiliation. In the aspiration to Good Governance, the New Public Management principles must be implemented more intensive to eliminate the burden on the government caused by the inefficiency in the civil service. New Public Management implementation must lead to a smaller government making it unattractive to appoint political loyalists to high level positions. Finally a policy concerning Human Capital must be developed, because it is required to perform Governance or other public management principles.